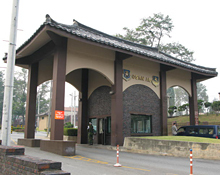 Osan Air Base is one of two major airfields operated by the U.S. in Korea and the only USAF facility in the Republic of Korea entirely planned and built by the U.S. from scratch during the Korean War. Team Osan is located just 48 miles south of the Korean DMZ. It's home to the "Mustangs" of the 51st Fighter Wing and 24 tenant units, including the Seventh Air Force.